Learn to trust the story and speak extemporaneously from the heart. 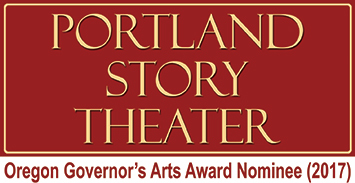 Lawrence Howard and Lynne Duddy of Portland Story Theater offer three different storytelling workshops so that you can learn to express yourself with this amazing art form. In our workshops, we teach intentional storytelling where you’ll learn how to tell stories improvisationally by being resourceful and using the power of spontaneity. Our approach teaches you to trust the story and speak extemporaneously from the heart. We offer three different workshops to fit your level of interest and your schedule. Join our mailing list to keep up with notifications about our workshops! If you just want to see if storytelling is your thing, take this lively workshop, Storytelling Crash Course. 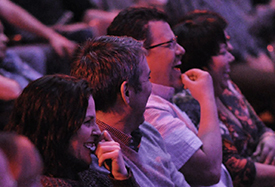 Fast-paced and fun, you’ll have a chance to discover your inner storyteller! No pressure. No performance. Make sure that you meet the prerequisites and then call 503-284-2226 for registration information. If you’re ready for a creative challenge and have been thinking that you’d really like to explore storytelling in depth, the 7-session Art of Personal Narrative is the perfect opportunity to discover, craft, and tell your story to a live audience. This workshop is offered in September, October, November, February, March, April and May. Click here for the schedule of specific dates, find out what to expect and whether you meet the prerequisites for this one. Note: Pricing shown for public events at Portland Story Theater’s Home Studio. If you are interested in bringing a workshop to your business, school, or nonprofit, there are additional costs for on-site workshop sessions. Thank you.